Landscapes of Development analyzes the impact of development policies and politics on the physical environment of the Eastern Mediterranean, a region defined here not as a rigid geographical area but as a larger cultural context. Since the end of World War II, the drive toward development has featured dreams of progress and emancipation intertwined with processes of reconstruction, decolonization, and nation-building, as well as transnational agendas for socioeconomic restructuring (capitalist or otherwise) and larger postwar/Cold War power politics. 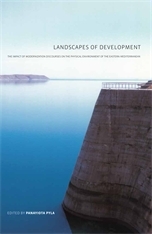 In physical terms, the drive toward development has been responsible for the rapid growth of metropolitan centers, the radical restructuring of rural landscapes, and the proliferation of dams, irrigation systems, and other infrastructures. Eight essays examine formal manifestations of development, placing the spotlight on urban and rural schemes, housing projects, and agro-landscapes and dams from Israel to Turkey, and from Greece to Syria. These contributions are all grounded in new scholarly research, employing a variety of critical tools to situate built works within the larger sociopolitical context that influenced their design and implementation, and to reflect on their social, cultural, and environmental impact.